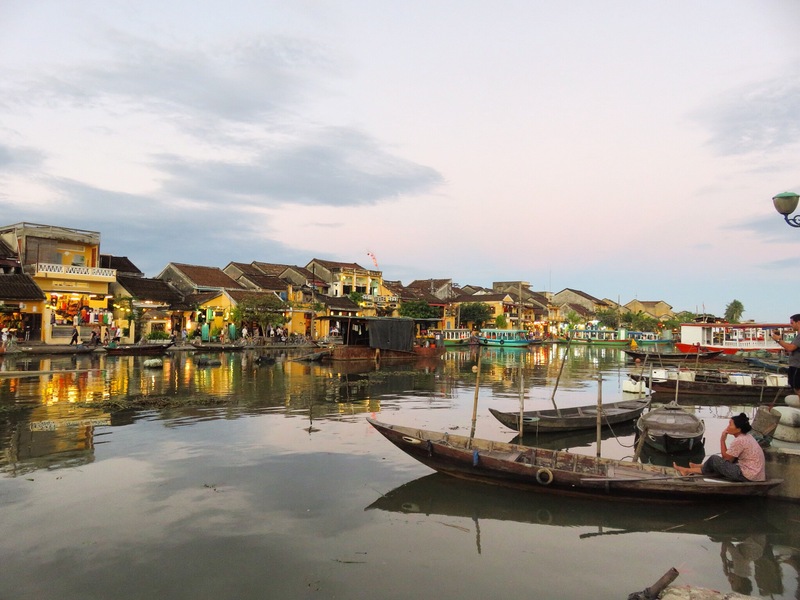 I had heard so many good things about Hoi An and because of this it was one of the places I was looking forward to visiting the most in Vietnam and it definitely lived up to my expectations. 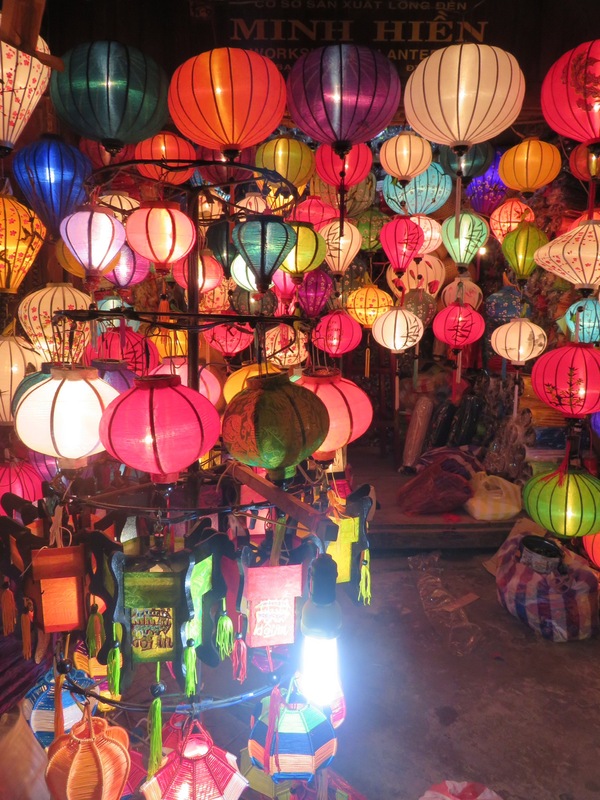 Hoi An is the place to go if you are wanting to get custom made clothes and shoes, tailor made suits and leather goods. 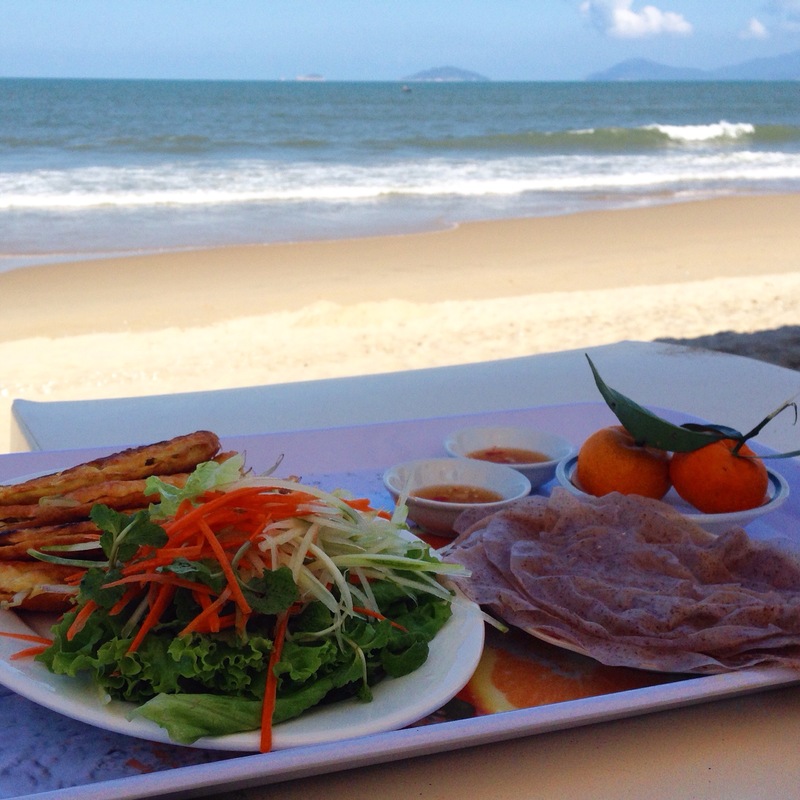 It is also the place to go to eat delicious food, relax and immerse yourself in Vietnamese culture. 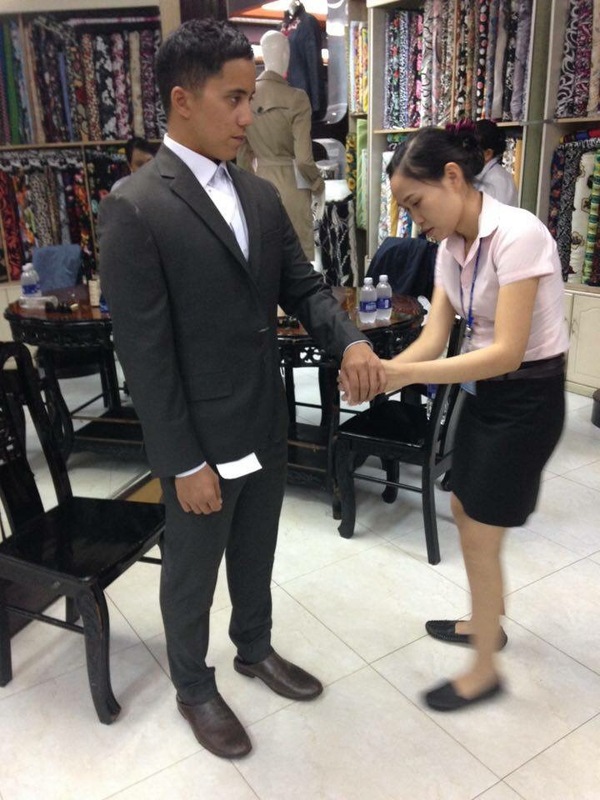 Choosing the right tailor: There is something like 400 tailors and 100 shoe stores in this little town. It can get a little over whelming when trying to choose the right one. The most important thing to look out for is fabric options and free alterations. We went with Adong Silk after a reccomendation from friends. Tom got a suit and a shirt for $200 AUD and it fits him perfectly. 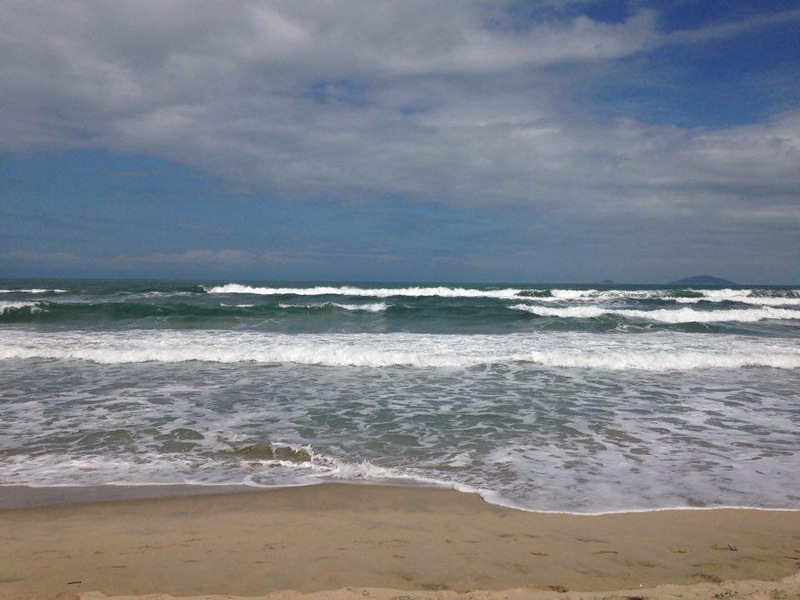 The whole process took three days as he needed some adjustments so keep this in mind when deciding how long you want to spend in Hoi An (you’ll want to double your time here any ways, it’s amazing!) They keep your measurements on profile so if you decide you want another one when you get home, all you have to do is email them! 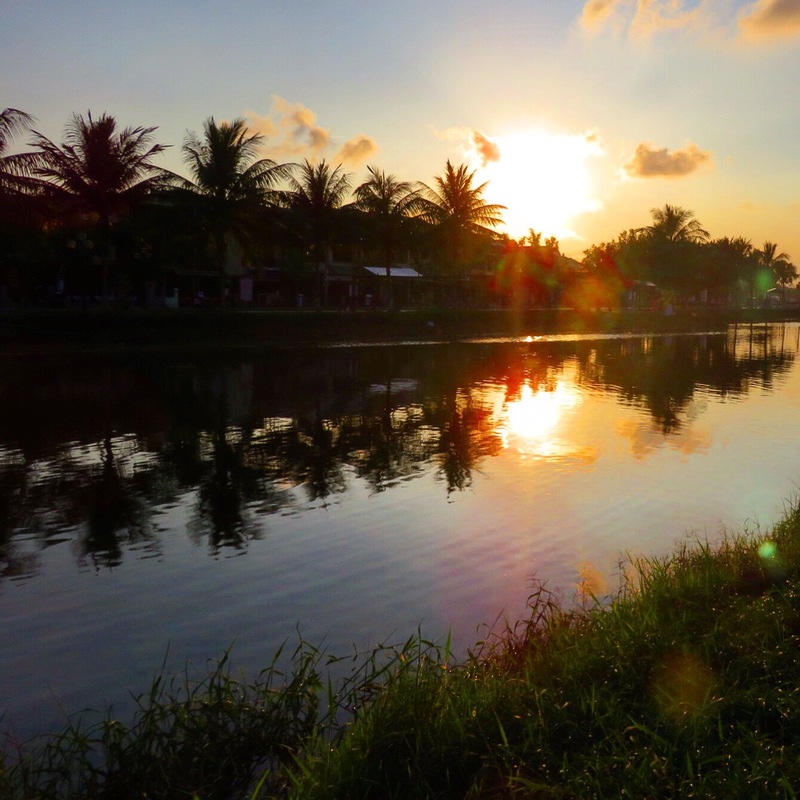 Where to stay: There are plenty of great options to stay in Hoi An but not too many hostels. We stayed at Edens Homestay which was cosy, had a delicious breakfast and was close walking distance to the Ancient town. What to do: Since there are so many tailors in a small town it seems like every second shop is a tailor. The buildings in the Ancient town date back to the 15th century so it has real character and a romantic feel about it. It’s great to take some time just wandering around and admiring the architecture. Amongst the tailors and shoe stores you will find excellent coffee shops, bars and restaurants. Everything closes down quite early though so this isn’t a party town! The best place to be is by the river. On either side it is lined with bars and restaurants and it has an awesome vibe to it. It is at is best at sunset. It is absolutely beautiful. When the sun finally goes down there are ladies selling candles in boxes shaped like lotus flowers. The idea is to put the candle in the river and let it float for good luck. They make the river look even more beautiful and magical. 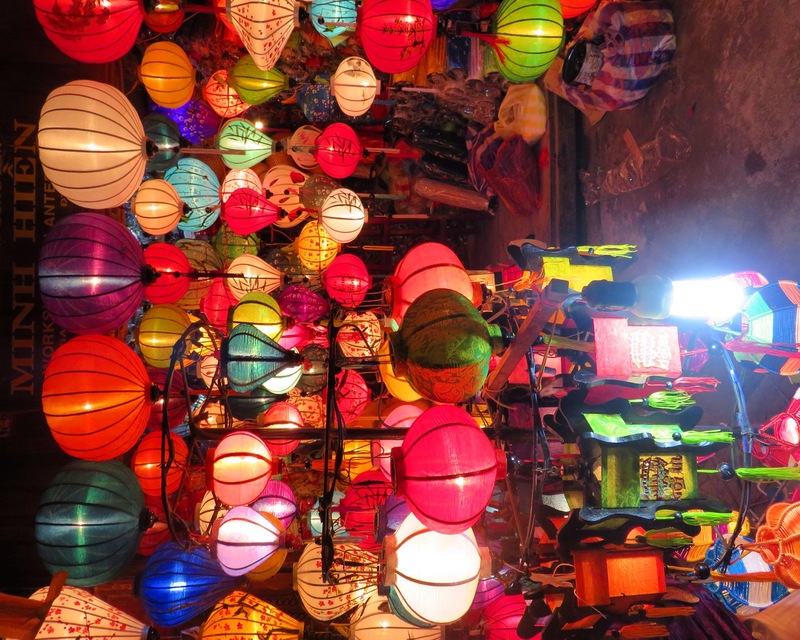 Every night there is a night market aimed at tourists which is full of beautiful lanterns, vendors selling snacks and all your usual market goods such as jewelry etc. 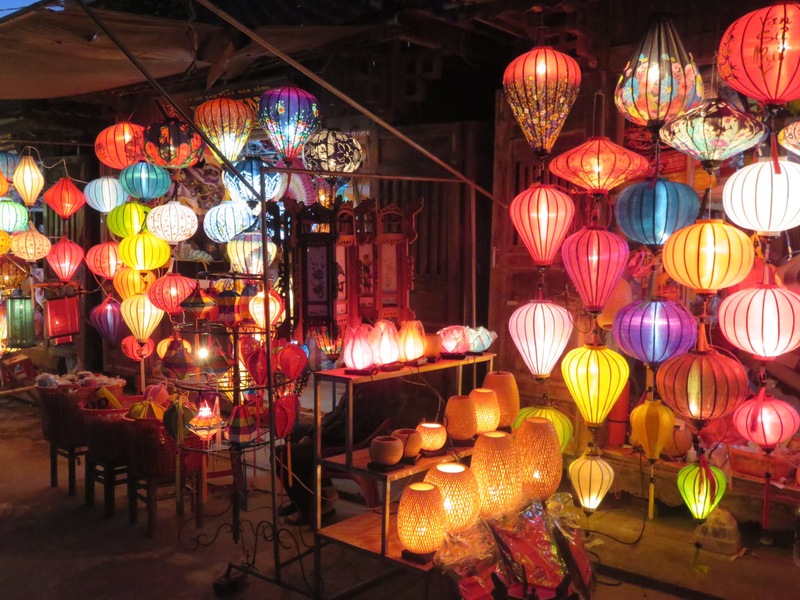 They are worth checking out, even just to see the beautiful lanterns. 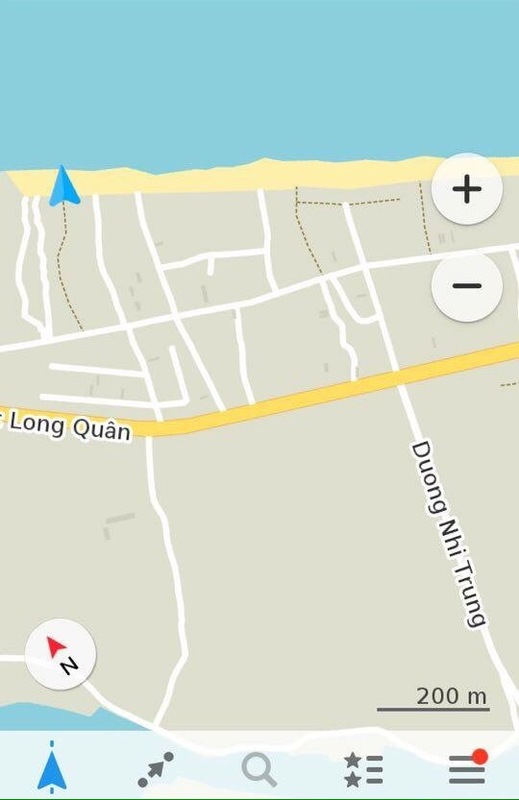 As if Hoi An couldn’t get any better, there are two beaches within 2kms of the Ancient town and unlike Nha Trang, the weather was perfect while we were there. You can either cycle or rent a motorbike. Our favorite beach was An Bang beach. The sun beds are free if you buy a drink and you can even get food delivered to right your sun bed. The beach was stunning, the food and drinks were amazing and it felt good to be helping out a local family as they were preparing all this straight from there house! The blue arrow is where we were on the beach. Choose the blue chairs when you get there. Where to eat: The restaurants by the river tend to be more pricey. If you stick to the restaurants away from the main strip they are much more affordable. One of our favorite places was Chau My which is owned by a lovely family. It’s off the main strip but you still have a nice view of the river. 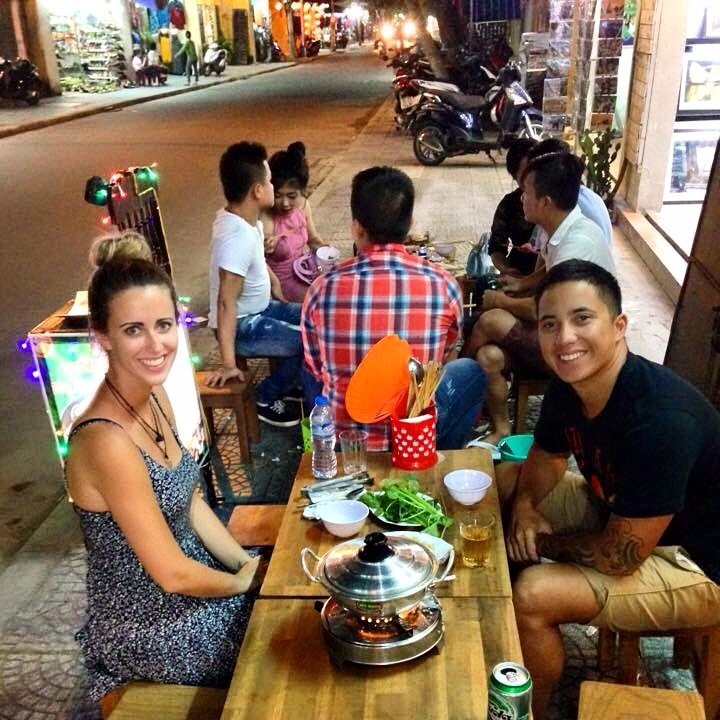 They do a great Cau Lau (a local Hoi An noodle dish made with water from the local well) and have cheap home made beer. We ate here quite a few times! If you want to try a Vietnamese hot pot (similar to a Fondue) I would highly recommend Nuong Khoi. It has a relaxed street side setting and really cheap hot pots. We had an amazing seafood one. The seafood was so fresh. 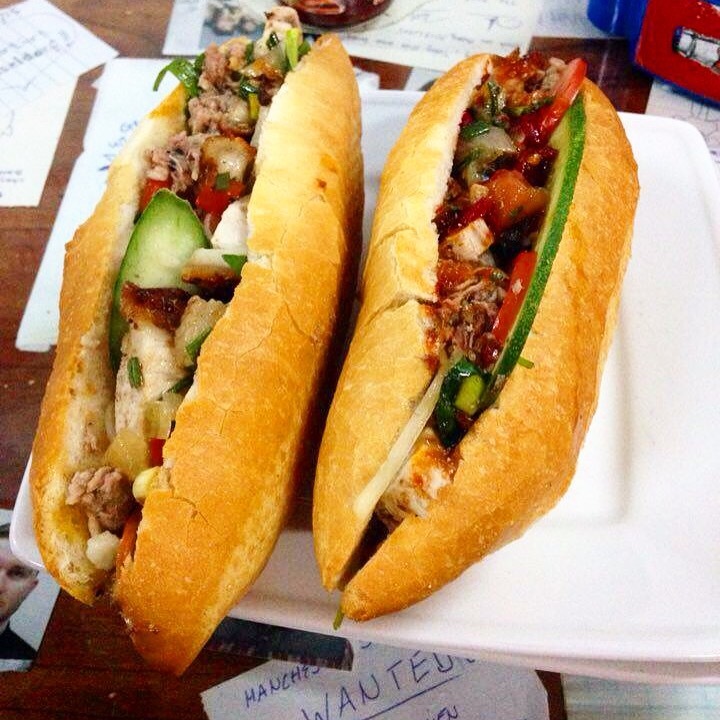 Banh mi is a very popular street food in Vietnam and the best one just happens to be in Hoi An at Banh my phuong. Even Anthony Bourdain came here on his popular travel show ‘No reservations’. A Banh mi is a delicious baguette served with mayonnaise, pate and different types of pork such as roast pork, BBQ pork and some cold cuts. 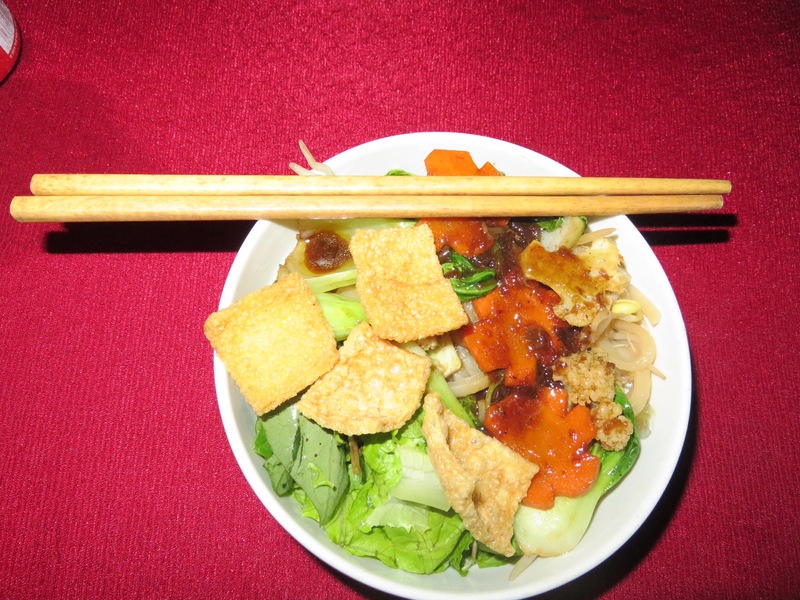 It also has pickled carrot and cucumber finished off with some chilli. I’m not the biggest fan of pork but this sand which was amazing! They also have other food there if you don’t want banh mi. 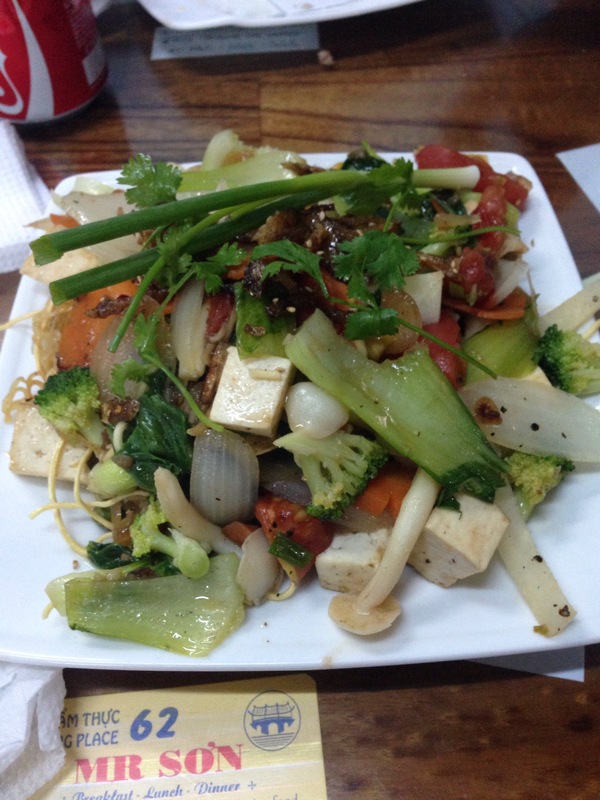 The veggie stirfry is massive and very tasty. If you’re looking for desert Enjoy! Is the place to go. 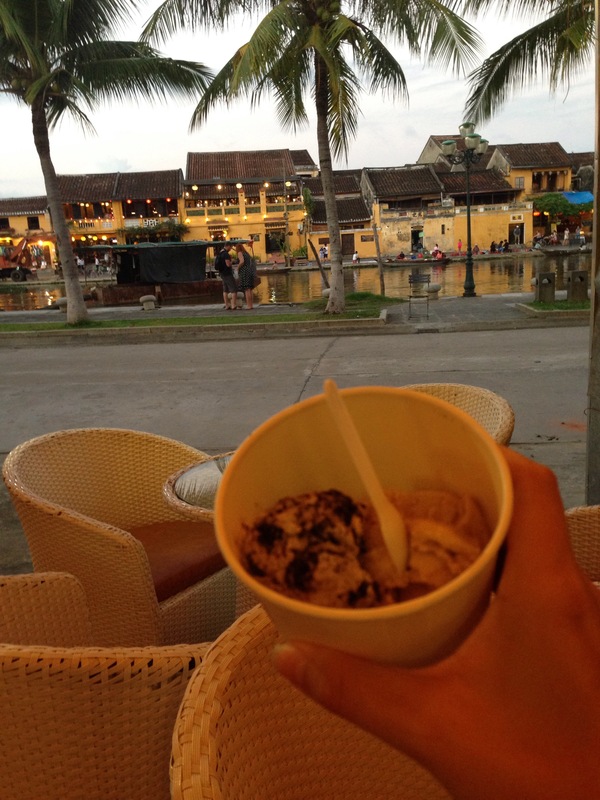 They have amazing ice cream and toppings where you pay by weight. I loved the sated caramel. We ended up staying here for 6 nights and we could have easily stayed longer if we had enough time. It is definitely a place I think everyone should visit in their lifetime. I would go back here in a heart beat! How good is it?! Glad you enjoyed the post, thanks!